George Aldred had a difficult young life. Born Henry George Aldred on 31 January 1896 in Kingston, Surrey, he was named after his father Henry and known as George. He had an older brother, William, born in Chelmsford, Essex, c1893, (later Corporal 7442, in the 3rd Dragoon Guards and discharged as physically unfit on 29 January 1916). Also two sisters – Mary born c1894 and Winifred born c1897 – and a younger brother John, whose birth was registered in Guildford in 1901. George’s father, Henry, was born in Headley, Hampshire, c1858. Perhaps deciding he wanted to see the world, he joined the military and served in India from 1876 to 1889. He returned to the UK in May 1889 and was based at Woolwich, Aldershot, and then Warley Barracks in Essex. His army records show he had suffered from many illnesses, injuries and diseases including herpes, rheumatism, fever, gonorrhoea, dyspepsia, ague, tonsillitis, diarrhoea, syphilis, and various wounds and abrasions to his arms and legs. He was discharged with a pension after 18 years’ service in October 1894 and worked as a labourer for the next five and a half years. Henry must have met George’s mother, Ellen, sometime before he was discharged from the army. She was nearly 20 years younger than he was, and their son William was born c1893 when Ellen would have been about 16. (Ellen’s maiden name isn’t known and a marriage record hasn’t been found.) By 1900 they had four children. Possibly because money was tight, Henry returned to the military at the age of 43. He enlisted as Gunner 8686 in the 115th Battery of the Royal Field Artillery. He listed his next of kin as Ellen and her address as Slyfield Green, Stoke, Guildford (about 20 miles from his own birthplace, Headley). In March 1901, the census recorded the family at Weedon, Northamptonshire. (There was a military ordnance depot at Weedon.) Henry and Ellen, with children William, Mary, George and Winifred, were boarding with George and Jane Lewis and their daughter Elsie. George Lewis, like Henry, was a gunner in the Royal Artillery Reserve. A month later, Henry was discharged – described as ‘termination of engagement’ – with a pension of 10½d per day for life. His contact address on the termination document, originally Slyfield Green, Stoke, Guildford, was later crossed out and replaced with GPO, Farnham, Hants. Another son, John, was born in the third quarter of 1901. It is at this point that the family’s history becomes even more sketchy. Between 1901 and 1904 Henry either left the family or died. Certainly something catastrophic happened as in the 1911 census, a nine-year-old John ‘Alred’ from Surrey and 14-year-old George ‘Alred’, birthplace “unknown” turned up in a Nazareth House in Southend-on-Sea. This provided accommodation for the aged poor and for invalid, sickly or incurable children, mostly those from the Roman Catholic faith. Unlike most other Nazareth Houses, Southend particularly catered for older boys. It’s not clear when George and John moved into the Nazareth House. It may have coincided with their mother, Ellen, taking another partner around 1904. She was listed on the 1911 census in Staines, as Mrs Steele, living with John Steele at Toll Cottage, Kingston Road. John Steele was born in Bow c1879 and was an invalid. Ellen, whose birthplace was listed as Chelmsford, was working as a laundress. The census recorded that they had been married for seven years and had two children. (In fact, they didn’t marry until 1929 in Romford.) Also living with them were two more sons: Nick Steele, born c1905 in Greyshott, not far from Headley where Ellen’s first husband was born; and Edward, born in 1907 in Staines. One of Ellen’s daughters, Winifred Aldridge (sic), was also with them and listed on the census as a ‘visitor’, age 14. In late 1912, perhaps soon after George left the Nazareth House, he joined the navy. According to his military records, he had brown hair, blue eyes and a fair complexion, and was a gardener. Between 1912 and 1916, he served aboard the Ganges, the Crescent, the Victory and, from September 1913, the Queen Mary. His character was noted as ‘very good’ and his ability as ‘satisfactory’. In 1916, the year he was killed in action, George was a Signaller, J/20605, aboard HMS Queen Mary. He was one of two Datchet men on board. (The other was John Bettles.) Their Commander, Robert Harman Llewelyn, was the nephew of the former vicar of St Mary’s and was a regular visitor to the village. The Queen Mary took part in the largest fleet action of the war, the Battle of Jutland in mid-1916. 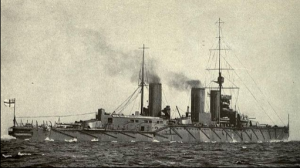 On 31 May, she was hit twice during the early part of the battle. Her magazines exploded at 16.25, sinking the ship with the loss of 1,266 crewmen. There were just 20 survivors; 18 picked up by the British and two by the Germans. 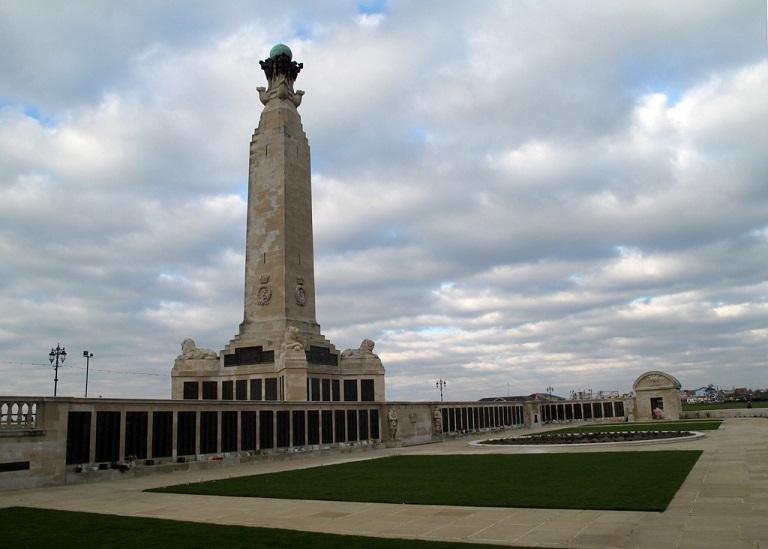 The Naval Memorial commemorates around 10,000 Royal Navy sailors of the First World War who had no known grave, the majority of deaths having occurred at sea where no permanent memorial could be provided. Henry George Aldred was awarded the Star, Victory and British War Medals. In 1916, when George died, his mother’s address was listed as Ebenezer Cottage, New Road, Datchet. It’s not clear what brought the family to Datchet nor the date they arrived, though it appears to have been between 1911 and 1914. Their frequent brushes with the law meant they were often mentioned in the local newspapers. They were in Datchet in March 1914 when the Slough, Eton & Windsor Observer reported “Among others, John Steele, a stepfather, was accused of not sending children regularly to school. The case against him was dismissed as his step-son alleged he was 14.” This would have been the 13-year-old John Aldred, born in 1901. In October 1915, the same paper reported that John Steele, a general dealer of Datchet, was summoned for keeping a carriage without a licence. PC Nicholls (also remembered on war memorial) saw the defendant’s wife [Ellen] using a two-wheeled dog carriage to carry three passengers. They were fined £1. In August 1918, George’s younger brother John was accused of assault. Slough Eton & Windsor Observer reported “Alleged attempted highway robbery, accused committed for trial. John Aldred, 17, labourer of Ebenezer Cottage, Datchet was charged with assaulting Alice Elizabeth Gage, domestic servant at Berkin Manor, Horton, with intent to rob her. …/… Prosecutrix said that on Thursday evening she was returning from her home at Datchet to Berkin Manor, Horton, and she had just got past Mill Place when a man came up behind her…/… [Prisoner] said “The reasons I did it is because I have been out of work for the last six weeks and I had got no money. I thought I could get some that way. I told my father that I was at work at the Jam Factory and I wanted some money to pay for my board.” …/… The Bench committed John Aldred for trial. Ebenezer Cottage had been occupied by the Nuth/Neuth family in the 1911 census. George Nuth was a market gardener who was born in “Kinston” (possibly Kingston, where George was born) and so he may have known the Aldreds. By 1916, the Nuths were living at Talbot Cottages. In 1918, the newspaper reported that Ellen Aldred visited Mrs Nuth and had been ‘rustling about’ in the garden with her son, George Nuth, when she ‘lost’ her brooch. Ellen later accused him and his mother of stealing this gold brooch, said to be worth £1. She was described as Ellen Mary Aldred of Windsor; and the article indicates that she wrote to the Nuths from an address in Southall asking about the brooch. Brother, William, was recorded at Ebenezer Cottage on the 1918 Absent Voters list. He was still in the area in late 1919 when he was fined three shillings for cycling without headlights. In 1921, Ellen Steele ‘of Datchet Common’ was summoned for moving pigs without a licence. And in spring 1928, the paper reported that John Steele, a “cripple”, aged 50, was in court with his son Edward, claiming he was owed money for work they had done.